(Art) Amalgamated is pleased to present FAIR, an interactive installation of work by Mikel Glass. The exhibition, which is a commentary on the art market, will take place in two distinct spaces in the gallery. One space will be a broadcast studio – disguised as an artist’s studio. Separated by a glass and steel wall, the other half will feature six large-screen monitors that will simultaneously broadcast a constant feed of different, but related, “hyperactive” videos as they, along with an array of audio speakers, submerse the viewer in a cacophony of sights and sounds from the art fairs and featured segments exploring several specific artists and themes. FAIR, Glass’s first show with (Art) Amalgamated, includes recent works as well as earlier paintings to show the development of the artist’s work that culminates in the immersive installation. Instead of assuming an oppositional, documentary-like stance against the art market, Glass has chosen to create an elaborate, semi-fictitious world, which draws upon a myriad of influences and relies on the comedic and absurd to get its message across to the viewer. To accomplish this, an array of interesting and colorful correspondents, including William Powhida, Lisa Levy, Graydon Parish, Eric Doeringer, the legally blind play write Jeremy Basescu and fourteen-year-old Cami Rubach will report from the various art fairs in NYC during Frieze Art Fair week. Their observations, comments and impromptu interviews have been streamed and presented as “breaking news” bulletins, via the broadcast studio constructed within the gallery. 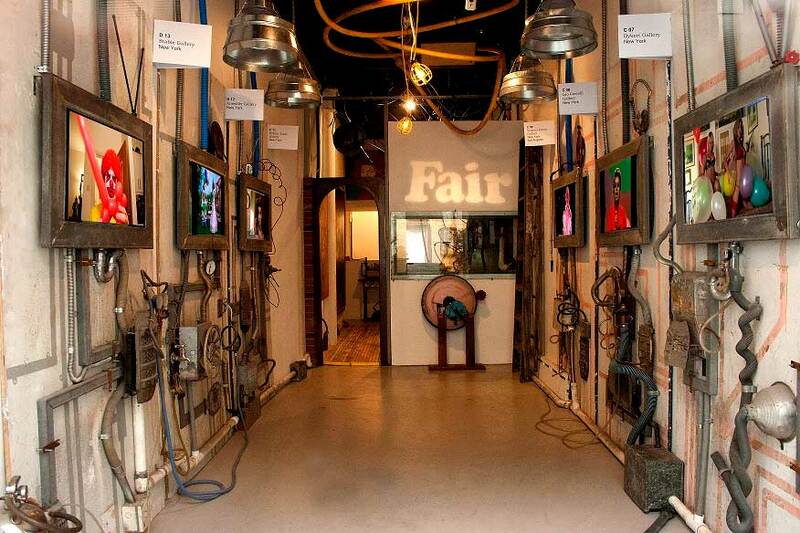 On www.fairnyc.com, a website created specifically for the exhibition, there are video vignettes of contemporary artists, as well as recorded and live streaming footage from the art fairs. Filmmaker Shimon Azulay created the video content in the exhibition with Glass. Additionally, Glass has enlisted a team of over 40 people to assist him to video, interview, build and design this installation. Sound engineer Rob Paustian has designed an audio program that grips and enthralls. Larry Lustberg of Stortz Lighting has lent his vision, expertise and equipment to help create a completely immersive environment. Artist Daniel Baltzer offered his engineering genius in collaborating in the fabrication of the installation. ABOUT MIKEL GLASS Mikel Glass (b. 1962) has had a 20 -year career exhibiting in major galleries and museums. Trained as a realist painter, Glass received a B.A. from Pomona College, in Claremont, Calif., and an M.F.A. from the New York Academy of Art. Glass’s work has been featured in numerous solo and group shows around the country. In 2009, he had a solo exhibition at The Taylor Museum, Fine Art Center in Colorado Springs, CO.